Market breadth analysis is a lesser known analysis tool comparing to price patterns or technical indicators. As there are not many technical papers and books written on the subject, most people would have no choice but to refer to the older information on how to utilize the market breadth statistics. The problem with the classic interpretation of the breadth data, however, is that the observations were done many years ago while the breadth data themselves are changing rapidly as the stock markets worldwide have been undergoing major structural change over the past 10 years. 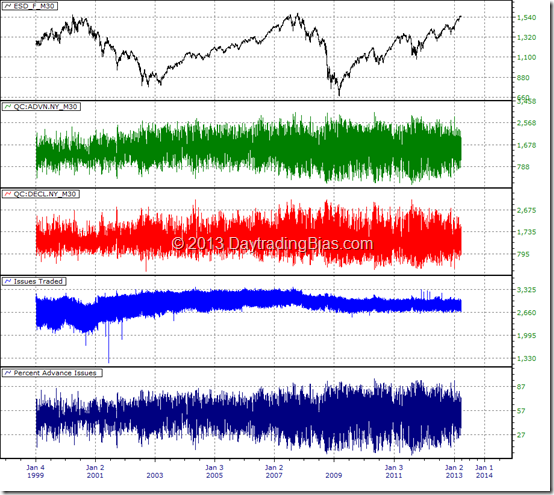 I am going to show you the changes happened to the advance / decline issues breadth data over the past 14 years and how these changes can affect classic breadth studies. Following is a 30-minute chart of Emini S&P 500, NYSE Advance Issues, NYSE Decline Issues, NYSE Total Issues Traded and NYSE Percent Advance Issues. Data appear in the chart from top to bottom in the order listed. This chart may appear as a highly compressed chart of some very noisy data with the exception of the S&P Emini contract. This overall impression of the data series is correct. The advance issues and decline issues data are very noisy data. There are no rules bounding what will be traded everyday. Hence, we never know exactly which issues are traded on any particular day. But do we really have no idea what will be traded at all? The truth is that it is pretty safe to assume that the most actively traded issues today will likely be at least traded quite actively tomorrow even though they are not necessarily turning up as the most actively traded issues again. There is the exception that if an issue is halted for whatever reason, we will not be able to trade it until it re-opens again. But that is exceptional situation and is rare. In general, over long period of time, certain stocks will fade away from being the trading community’s favourite while a new batch of stocks will replace them gradually. What are we suppose to see from the breadth data based on the common sense thinking stated above? First, the number of issues traded should be unstable. From the time the stock market open until the end of a trading day, many stocks should have been traded lightly only while just a small set of stocks would have the focus of the active traders. We should see that every day the total number of issues traded should start from a small number and increase to the usual expected norm. This is indeed what happened back in year 2000 and many years before that. Every trading day back then the NYSE would start from low 2000 issues trading in the first 30 minutes and then climb up to the average at the time around 3000 issues. 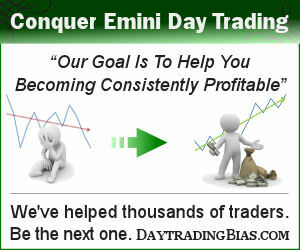 Some trading day you have a lot more total issues traded while some days you have significantly fewer ones traded. The data did not stay in a static range all the time. After year 2000, something interesting happened. Notice the obvious tightening of the daily range of the issues traded. This process continues even though the S&P was going through its first prolonged major decline. This development did not stop after the major bottom back in year 2003. The daily range of the traded issues continue to contract all the way until end of year 2007 right before the start of the financial crisis. Since end of 2007, the stock market has declined in the overall number of issues traded by abut 10% and settled in a very unusual stable horizontal range. A range that is not possible unless some form of control is applied to the stock market as a whole. I am not implying conspiracy theory here as many would jump to that conclusion immediately. What I am thinking of is way more interesting. My guess is that majority (if not all) of the stocks in the stock market are now handled by market making bots. These bots are all similar in design and they are all designed to take advantage of potential intraday change in market direction by observing what all other stocks are doing. All kinds of metric are used to position these bots on the right side of the market. Thus many of these bots simply make the same decision during the day at the same time, almost all the time. Do not underestimate the power of these market making bots. When they are all doing the same thing across almost all the traded issues, it could easily force the market moving with extreme intraday swings in majority of the stocks going from one direction to the other. My conjecture above is supported by the evidence in increased range in the percentage advance issues intraday. The first phase of the increase happened back in year 2000 but it was masked out by the huge bear market. At that point in time, it was difficult to determine if the increase in percentage advance issues was a function outside of the volatile bear market. With the benefit of several years of rising market condition, we can now see clearly how messed up the overall stock market is right now. The higher intraday volatility in percentage advance issues tells us that this synchronization of stocks moving together is a very dangerous game. Should the bots all bet wrong on the same side just once, there is no telling how fast the market will move as every bots will try to exit at market at the same time. We have already seen this happening several times. 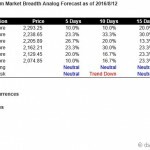 We have also seen how authorities using this market behaviour to adjust the price level of the indices at will. This change in characteristics of the advance / decline issues has caused serious setback in the classic breadth indicators depending on them. Due to the way the advance issues are bounded in such a tight range, the original intention of detecting extreme buying or selling with these breadth indicators cannot work properly anymore. 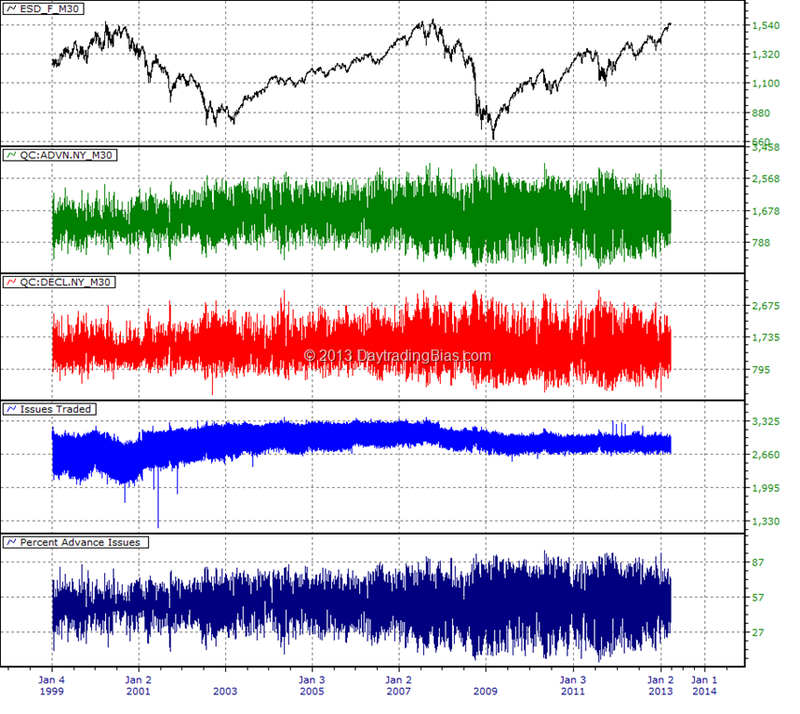 Without the natural swings in the advance issues observable up to year 1999 to year 2000, many classic breadth indicators were producing indicator patterns that do not resemble anything before year 2000. That caught many casual technical traders off guard as they are not really familiar with the behaviour of these breadth indicators. Since end of year 2007, the advance / decline issues data has become even more controlled. This in turn messed up the classic breadth indicators further. Many of these breadth indicators are perfect market timing tools in the last century. Now, they can no longer produce the highly accurate timing signals they were famous for. One of the main weaknesses with many of these classic breadth indicators is the use of moving averages to smooth out the raw data. When the raw data no longer has the cyclical characteristics, the smoothing of the raw data would either delay the signal for too long, or, dampen the information from showing up at all. 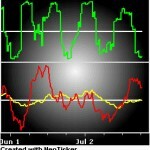 Potential solution to this problem is to adjust the smoothing method that may in turn leading to new ways to interpret these classic indicators in the current environment. Tick16 Long Term turning negative. 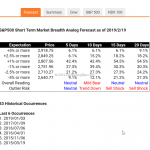 Statistically S&P will have at least 1 week of weaknesses.